this is the second of a set of reviews on some freely available materials pertaining to permaculture. These reviews will be informative resources not only to TI-G’s ecological project near the Aburi hills in Accra, but to any party interested in learning about permaculture. → great introduction for beginners. -visual presentation of Permaculture in actual food forests (in Australia, but this could be exactly on our project lands in Ghana). -the development and dynamics of a food forest are shown (Day 1 → 6 years). -the practical overview can serve as an inspiration to start your own food forest. -Geoff Lawton is a towering figure in Permaculture with many years of experience. -demonstrates clearly the advantages of Permaculture over traditional monocultural agriculture. The documentary starts with the questions „What is a forest?“ and „How to build a forest?“ The second question may be surprising. But it invites the viewer to reflect on the principles of growth and symbiosis at work within a forest and teaches the grammar and language of a forest. This documentary decyphers the logic and design behind the eco-system and points out what works and what does not. 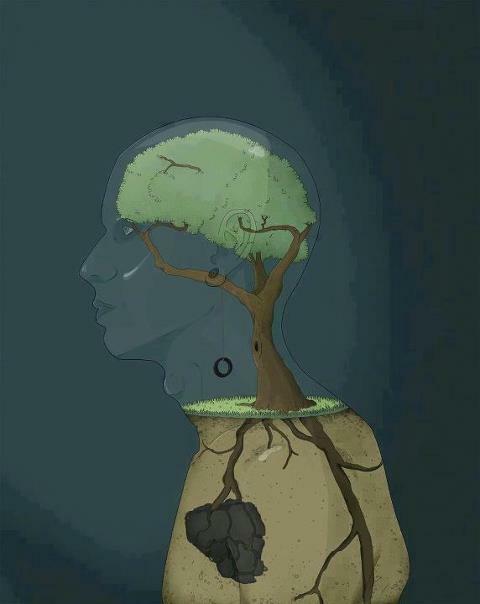 We thus get a blueprint of what is needed in order to build a good forest. Interestingly, Aba Hayford, the founder of the project Transcend-International Ghana is carrying out implemented numerous steps of the advice given in this documentary by Geoff Lawton as far back as 1986 when she began work on the project. Geoff Lawton draws an image of how the different sorts of plants play together in a forest: climax plants, understory plants, shrubs/bushes, herbs, ground covers, root yields, clumbers, and palm trees. 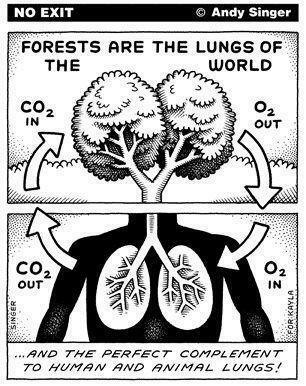 It‘s presented in a simple way for beginners to understand and have a basic definition of a forest. Geoff says that the main point is to observe the layers of a forest with our pattern eye. A key technical term which bridges the work of the founder of Peace studies Johan Galtung and the work of the founder of Permaculture Bill Mollison comes to mind: Geoff Lawton shows us the importance of looking at nature through the lense of isomorphism: recognizing similarities in the way the attributes of elements in a pattern of interaction form a distinct structure. Permaculture itself is one particular approach to agriculture inspired by the techniques and perspectives of the applied art of design. What Bill Mollison and his student Geoff Lawton put into practice was how to build a forest (here: food forest) based on designing principles taken from nature. In Permaculture, the main principle is that form follows function. The functions of the different parts/plants which play together are at the root of this agricultural design of nature. And these functions are best used by knowing about the mechanics and the engineering of ecology! Geoff Lawton differentiates between two sorts of plants: pioneer/support plants vs. production trees. At the beginning of a permaculture cycle, the support plants are mostly present: ground covers, short-term leguminous bushes, medium-term legume bushes and long-term bushes. Later on they die. This all serves to improve the quality of the soil and to ensure nitrate fixation. Afterwards the production trees, which generate outcome and food, use the generated minerals and the good soil thus generated to bear fruit. Et voilá! In general, this process starting with support species and moving towards production species occurs naturally. 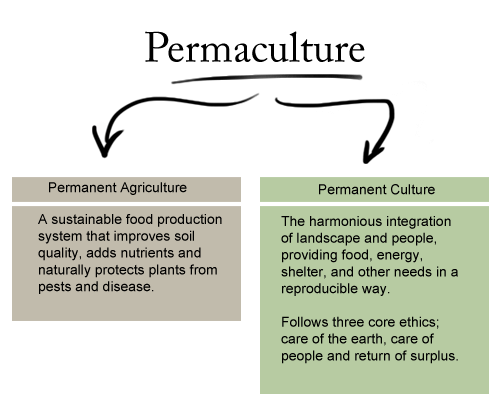 Permaculture uses these mechanics of ecology but also improves them with human agency. It‘s about making nature even more productive by enhancing natural cycles. With these basics in mind, Geoff Lawton goes on to show the chronological development of a food forest in New South Wales (Australia): More specifically, he describes a food forest at Day 1, Day 3, after 3 months, and after 6 years. Even though there are many different and diverse plants mentioned, which could be too complex for beginners of Permaculture/Agriculture, the visual way of showing this realistic development of a food forest leaves a great first impression to better understand the dynamics of Permaculture. Our project in Ghana was initially planned as a reforestation project for local woods that had been depleted from the periurban forests for commercial purposes. The current project intends to increase the number of fruit trees included in this reforestation process. Aba Hayford, the afore mentioned initiator of the project already planted numerous fruit species into the project such as passion fruit, avocado, mango and numerous different citrus fruits. Geoff Lawton then introduces the fruits that grow in his food forest: e.g. mangos, custard apples, avocados, jackfruits. These are all high productive fruit trees with long lives that happen to grow in our own climate zone south og Ghana too. A clear advantage Geoff shows here is that these fruit trees are usable as timber wood in the end. Such variables should all be taken into consideration while designing the farm. One learns that the most important part of designing a food forest is to create a stable ecological system in the first place. That is why getting a food forest started is most diffcult. The maintenance and adding on an existing food forest like the one at the project site in Ghana, on the other hand, is comparatively easy and much less work. If you have capacities, you can speed up the growth of the trees and have more diversity in the forest. This can be best done by cutting support plants frequently to provide production plants with valuable mulch. Donations by friends of eco-consistent agriculture and volunteer workers from all over the world can join our project in Ghana and contribute to increasing this project’s capacity. Just contact ghana@transcend.org. A stable food forest doesn‘t require that much of care and will grow and develop on its own (e.g. after leaving an established food forest untouched for a decade, it would take one person only a half day for ½ hectar for maintainance). A food forest also includes animals as supporters. 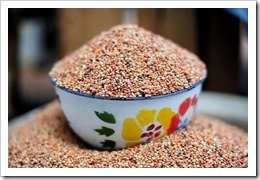 Chickens, turkey and lizards can help to get rid of pests and other damaging creatures for plants. Chicken also prepare the ground in the fantastic way through scratching and mixing the soil. Besides they break pest and weed cycles. What Geoff emphasizes is that Permaculture can generate solutions in any climate. It‘s about the connection of plants, that you can grow in your climate. Even in dry areas, weeds repair the soil’s conditions. The aim there is to remineralize the soil all the time to ensure an improvement of soil quality. This leads to completely stable eco-systems after about 10 years. What we want in our project in Ghana is: a diversity of plants and an interactive diversity between all the components on the project site. In the end, this diversity leads to permanent outcomes and production. The different fruit trees have different natural cycles and harvest can be done throughout the entire year. If well sourced, this project could also employ local subsistance farmers, who are at risk of pauperization due to the rapid increase of the capital’s socio-economic pressure on the periurban zone around Accra, where the project is situated. In comparison to the dominant present-day monocultural agriculture, Permaculture is not about how much production you get per tree. Rather, it is about the minimum amount of work going in for the maximum amoint of product coming out. Once a stable system is established, the amount of work is very little. Monocultural agriculture takes much more work to maintain and is way less efficient while not being sustainable. Food forests are soil-producing eco-systems that are therefore sustainable. This human-designed eco-system is – according to Geoff Lawton – able to ensure mankind to inhabit this planet forever because it allows the ecosystem to regenerate itself at its own pace – with some help from the naked ape.